This is a story about a fantastic place that few travelers find, a place once alive with intense human efforts and then abruptly left to the grass, trees, and brush. It’s a story of an American native society-I would call it “civilized”—that flourished and then disappeared. Jared Diamond* described societies that grew and collapsed due to vain consumption of their ecology. In contrast, I suggest that the little-known society of the Salinas Valley in New Mexico collapsed due to a forced adoption of someone else’s vanity. There’s both beauty and a lesson in the story. The area that is now New Mexico was occupied by the Spanish well before Jamestown was founded (1607). At that time, the approximately 10,000 native pueblo people of the Salinas Valley were trading goods with other natives. The Franciscans came as missionaries to convert the Indians to Catholicism. However, the Spanish also brought both the inquisition and enslavement, using the natives and to construct huge churches and to ship salt to Mexico. Salinas means salt pans; the salt was used in refining silver. The ruins of three magnificent churches remain at separate locations. 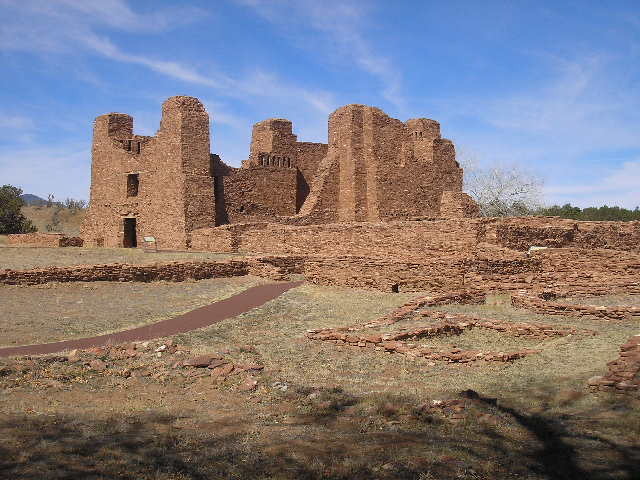 The Salinas Pueblo Missions National Park now offers the ruined cathedrals for your visitation. The brochures celebrate the beautiful architecture of the “missions” on the open landscape. Other literature infers a story of oppression. Friar Bernal also said, “…heathen Apaches … kill all the Christian Indians they can find … no road is safe …” The friar apparently apparently didn’t report that the Spanish, unable to conquer the Apaches, instead bribed them to aid in controlling the “Christian” people of the pueblos. And why is the Salinas story relevant? Because, like the Franciscans saving native souls from Hell, we are tempted to save a large population attempting to escape from the miseries induced by its current culture south of the border. However, I encourage us to examine our own limitations and the potential outcomes of the salvation process. * Jared Diamond Collapse. Viking Penguin, 2005. If the text appears fragmented or the photo is not clear in your email, click here to see the story as posted. WordPress introduced a new digital editor, and strange things happened in the email version of Blog 141. This entry was posted in Blog, Governance, Society and tagged Abo, Gran Quivira, immigration, Indian ruins, Pueblo Missions, Quarai, Salinas National Monument, Salinas Valley. Bookmark the permalink.